Waiting around for a commercial plumbing service can be a serious problem for any business. Many plumbing problems may disrupt your ability to run your business, costing you time and revenue. We have technicians located throughout the metro Kennesaw area who are ready to respond at a moment’s notice to any plumbing emergency. Rather than wait for a plumber to find a convenient time to help you, call the rapid response team at Plumb Xpress Plumbing & Drain. Our experienced technicians will always arrive in 90 minutes or less so you can have your repair started quickly. 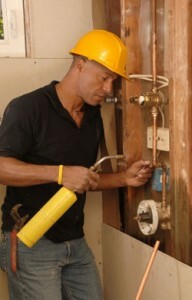 You can also count on our commercial plumbing to be done right the first time. Our plumbers undergo a thorough pre-employment test in addition to their state licensing, so you can rest assured that they are capable performing any repair both quickly and correctly. Our dedicated employees can have most problems fixed in less than a day, and even major repairs to sewer and water lines can be completed in as little as three days. This means that we will be out of your way fast so that you can get back to business. Call Plumb Xpress today and get your plumbing repair underway right away. Plumb Xpress Plumbing & Drain will do more than just save you precious time on these commercial plumbing services. Our unique business model allows us provide our services at a very affordable price. Our technicians are paid hourly, unlike the technicians at some other companies working for a commission. By doing things this way, we guarantee our plumbers look for the most effective solution to your problem, not the most expensive. We never charge a diagnostic fee on any commercial plumbing work we perform. In fact, we never hide any fees, so the price you’re quoted will always be the price you pay. For more information on our commercial plumbing contractor services across the Kennesaw area, contact Plumb Xpress Plumbing & Drain now.